Today, when you order "Ninja+ Deluxe SILVER (Gimmicks & DVD) by Matthew Garrett", you'll instantly be emailed a Penguin Magic gift certificate. You can spend it on anything you like at Penguin, just like cash. Just complete your order as normal, and within seconds you'll get an email with your gift certificate. "Holyshoot! Matthew had created a new and origianl trick. 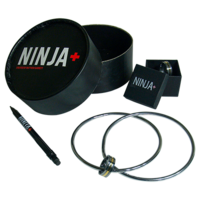 It works great both with Ninja Rings and on it's own." "Holyshoot!! Matthew has created a new and original trick. 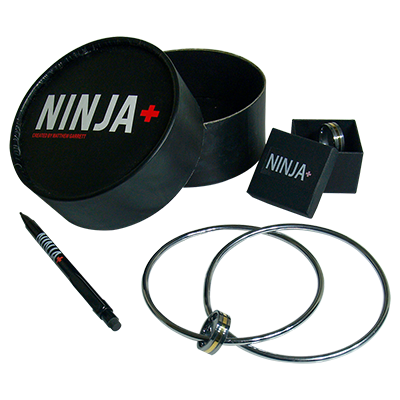 It works great both with Ninja Rings and on its own." - Shoot Ogawa, Ninja Rings Master. "I have thoroughly enjoyed fooling people with this. Thank you Matthew, you have a great idea here!" "Heartily recommended for close-up and walk-about.Ali Bongo, former President of the Magic CircleNinja+ is the only magic effect I've bought in the last 2 years! That's not just a quote, it's the truth." "The best linking rings routine ever!" "I suggest buying Ninja+ soon as possible, a brilliant routine!" This is a diabolically wonderful spin on a classic of magic!!! I have been practicing like crazy ever since I received the DVD’s and rings. I’m addicted to this effect. Absolutely beautiful and cool variation. And the props rock!! The rings (all of them) are made very well and the DVDs have a lot of great ideas. These rings are 1/2" larger than Ogawa's rings however and I would have liked to use them all together. Lots of practice to master the moves, but if you want a great ring routine that will leave a lasting impression, this is worth the work.